Hello Kitty & My Melody is an Event Course in Super Mario Maker, released on May 26, 2016, and based upon two popular franchises from Sanrio. It unlocks either the Kitty or Melody Mystery Mushroom costumes, depending upon the route the player takes. 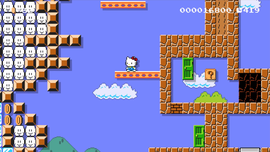 The level begins with two different routes, with Kitty's route on the left, and Melody's route on the right. Kitty's route begins with a lift and some block art of Kitty herself. A horde of Piranha Plants follow, along with some Lakitus and another block art of Kitty. Melody's route begins with some lifts and some block art of Melody herself. After a few Big Piranha Plants, some Skewers follow, along with more lifts and a few Bumpers leading to another block art of Melody and a warp pipe. Both paths lead directly to the Goal Pole. Pipeline to the Other Side • Block Town • 1-1 Remix (Ground) • Spinning Boo Buddies! 5-3 Remix (Shoe Goombas) • 1-2 Remix (Yoshi) • Zigzag Lava Bubbles • Go for the 3-Up Stomp! Music Notes • Conveyor Belt Sprint • Shell Shot! • Find the Fire Flower! This page was last edited on March 30, 2019, at 02:21.